And so it began. A generation of new holiday traditions was hatched unto our home like a baby chick on Easter. That year, the Bunny left special “scavenger hunt” glasses with clues to hidden goodies all over the house. To watch their joy while running from room to room was complete parental bliss. They haven’t stopped talking about it for a year. Holiday traditions are those things from which memories are made. For kids, it offers a sense of consistency and expectation and fun! Here’s some others you can try! In my old neighborhood, we’d get about six families together the day before Easter and do a morning egg hunt for all the kids. The parents would have coffee and munchkins and maybe a mimosa or two and watch the kids run around collecting plastic eggs. Good times. 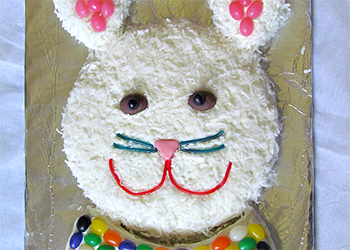 My friend Kelly makes a bunny head cake each year for her family with licorice whiskers and the whole bit. To them, it’s not Easter without the bunny cake. My in-laws do an “Egg Cracking Tournament” where competitors pair up and knock the tips of two hard boiled Easter eggs together. The last person standing with an uncracked shell wins! Don’t kid yourself, this gets pretty competitive. Pinterest shared the DIY Easter Bonnets idea with me, which I love because I love crafts. What kid wouldn’t crack up seeing his family walk around with some nutball pompom and paper plate hats on? 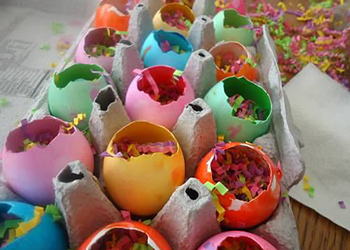 Have you heard of the Mexican tradition of cascarones which are confetti-filled eggshells that you break above the head of friends and family as part of the Easter holiday celebration? Try this one outdoors unless you have a really good vacuum. Traditions don’t have to be “traditional” either. I once read of a family who did a “Great Banana Hunt”. Wait, what? Exactly. This family had a scavenger hunt for bananas on Easter. The more silly, unique and totally off-the-wall it is, the more the kids will love it. Previous PostCharmingfare Farm’s Egg-Citing Egg Hunt runs Saturdays & Sundays through Easter! Next PostListen up, Peter! Open Letter to the Easter Bunny.